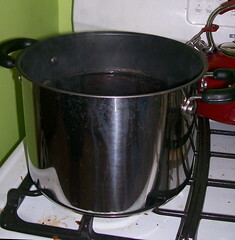 Even though I didn’t make it by the Closing Ceremonies of the 2010 Olympics, I was determined to finish my Greenjeans sweater. 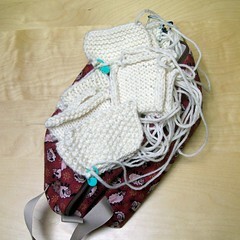 I finished the last few rows and sewed on the button this morning. I am not in love with the button after all. I need to take it off and move it inward (away from the bound-off edge) anyway, so I might replace it entirely. It’s an incredibly comfortable sweater, despite the sleeves being a teeny bit too long (which was completely my own doing). 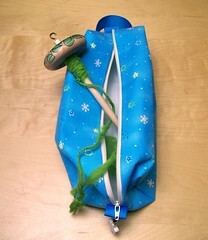 Notes: Thank you, Amy, for writing the instructions for picking up the neck-/buttonband the way you did. 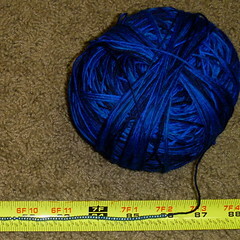 If I had realized ahead of time that I was about to pick up 262 stitches, it probably would have given me more pause. 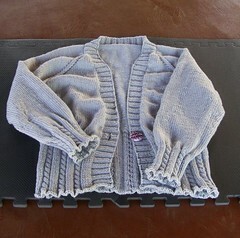 Since my row gauge was off, I did extra rounds on the sleeves in between decreases, and I made the sleeves full-length. I also made the body a little longer. 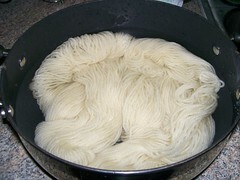 This was a really nice, clear, straightforward sweater pattern. It’s been quite a while since I made a sweater for myself. I should make some more. I’ve been waiting for this book to come out since Martini was interviewed on Cast-On last year. I enjoyed her first memoir – actually, since it was about her experience with Postpartum Depression, maybe enjoyed isn’t the word I want to use. But it was a great book. So, I had high hopes for this second outing, and I was not disappointed. I pre-ordered through Amazon and received my copy today. Since Lil Miss was napping and K was watching something that appeared to be a movie involving World War II, I headed out to the Sky Chair on the deck. And there I stayed until I finished the book. 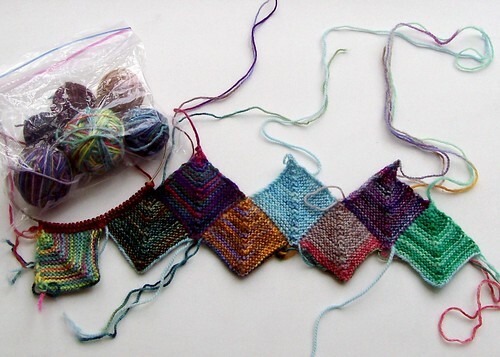 It seems like such a silly idea: A memoir about knitting a sweater? But like Stephanie Pearl-McPhee (who makes an appearance), Martini isn’t really writing about knitting. She’s writing about knitters. 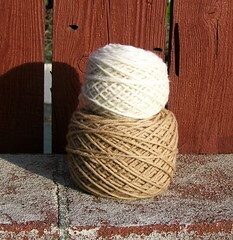 Mostly, just one knitter. 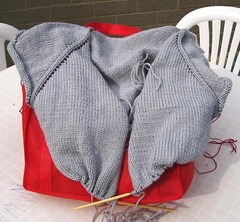 Over the course a year, Martini sets out to complete a sweater known as “Mary Tudor”. As she tackles the challenges of acquiring an out-of-print pattern and substituting for out-of-production yarns (no small feat for a project in which color is key) as well as stranded colorwork and steeking, she gathers together details about the designer, Alice Starmore. She explores why knitters are so attracted to Starmore’s famously difficult-to-obtain and difficult-to-knit patterns, and how far they can stray from the designer’s vision yet still remain faithful to the project. 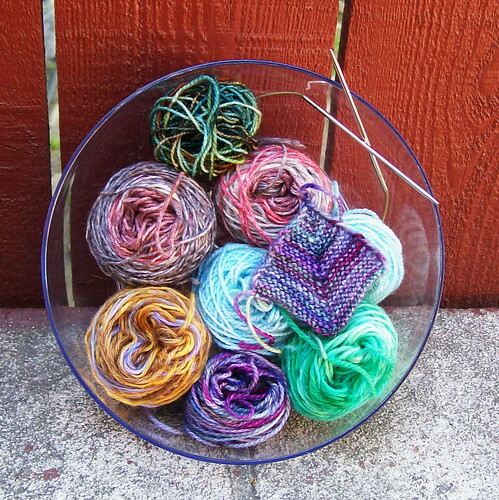 Martini travels to Rhinebeck, Nashville, and Toronto to interview bloggers well-known to knitters around the world. The history of Tudor Roses and the Alice Starmore brand intertwine with the history of knitting in the Shetland Isles and North America and the life one particular American woman in the early twenty-first century. Witty and self-deprecating, Martini doesn’t hesitate to share her liberal leanings or drop the occasional curse word. Her writing style is clean and sharp, a pleasure to read. She’s clearly aware of the absurdity of her “quest”, which just makes it all the more enjoyable. I gave it 5 stars out of 5. Now that the Knit Picks catalog for March has arrived, I can show you all my favorite recent knit for them, the Praying Mantis, from Amigurumi Knits. Clearly deep in contemplation, she’s a thoughtful one. Also, being an outdoorsy sort, she can’t resist climbing a nice tree. But she didn’t mind hanging out at work with me, either. She found that Piggie, who regularly appears as my Ravatar image, is a very good listener. But then she seemed to be getting just a little bit too close for comfort, so it was time to send her off to Washington for her professional photo shoot. 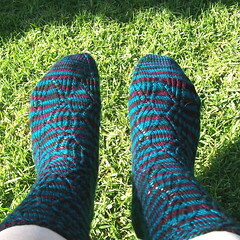 Knit from Wool of the Andes in Green Tea Heather and Fairy Tale (which is a really nice shade of purple) with two sets of bamboo DPNs. Chenille stems down the legs and in the thorax keep her upright, and fiberfill in her abdomen and head round her out (so to speak). 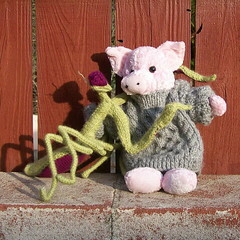 I really, really like knitting toys. 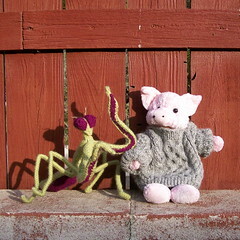 I’m going to have to knit a Mantis for myself. With the right colors, I could totally make myself a little N’Grath. 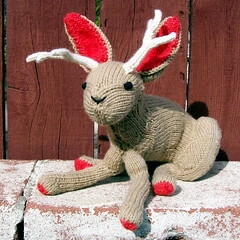 Last night, while watching Night at the Museum II, I put the final touches on the not-a-surprise jackalope for K.
Isn’t he cute? He’s so cute, in fact, that Little Miss keeps grabbing him and telling me that “the rabbit” is her “favorite animal”. 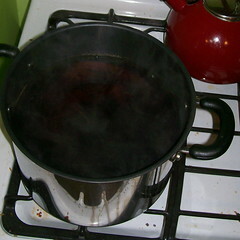 It’s a good thing I was already planning on making a second one. I love Hansi Singh’s wacky patterns from this book. They’re just so much fun! I think I found one tiny error – a line that reads “K1, K23” (actually, it’s not 23, but I don’t remember the number) instead of “Sl1, K23”, which would make a lot more sense. 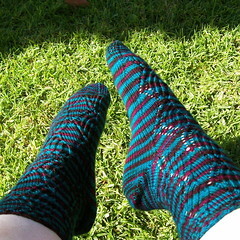 There are a few fiddly bits in the pattern, but it’s so worth it. And, wow, these amigurumi knits really are a good way to practice things like various increases, picking up stitches, and kitchener. 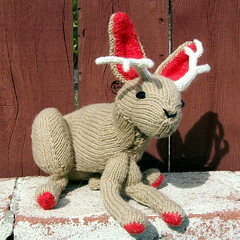 Pattern: Jackalope, by Hansi Singh, from Amigurumi Knits, but she’s also had the pattern out separately in her Etsy shop. 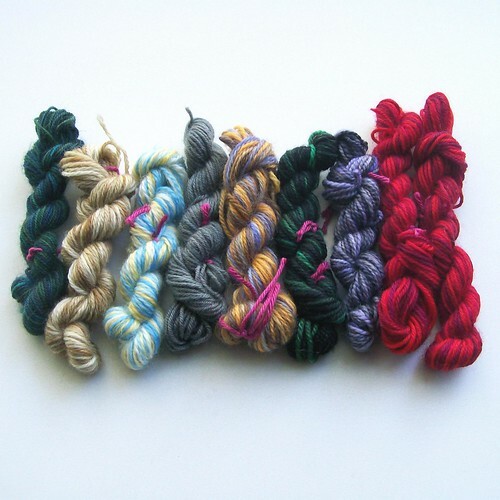 Yarn: Cascade 220, something less than 2 skeins, plus scraps of NatureSpun Sport for the face embroidery. 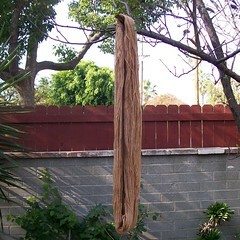 I dyed one skein of white Cascade 220 brown with tea, and a small amount red with strawberry Kool-Aid. 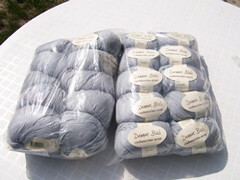 Needles: Crystal Palace bamboo DPNs, size 4, two sets. 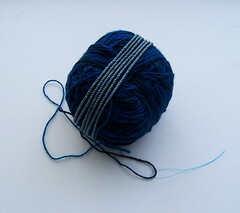 I’ve already started on a second one, actually, in thinner yarn and on smaller needles. 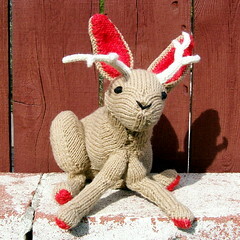 A baby jackalope. After doing the jackalope’s photo shoot in the back yard, I started tidying my desk. 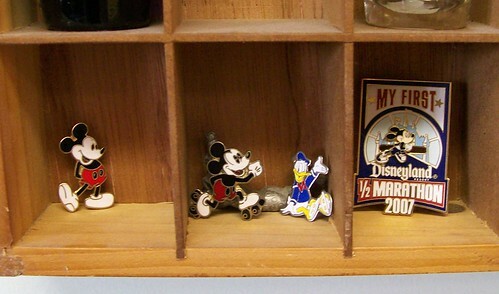 I decided to put some Disney pins that were hiding in my drawer out to be seen. That’s a shot glass display case there, mostly housing my Tacky Shotglasses of the World collection, a collection I discontinued a few months after Little Miss was born. The Half Marathon pin is from when I ran the race in 2007. The other three pins belonged to my grandmother and came to me after she passed away. After I put them out, I started poking around eBay for other pins. I really don’t need to start collecting Disney pins, right? Right? 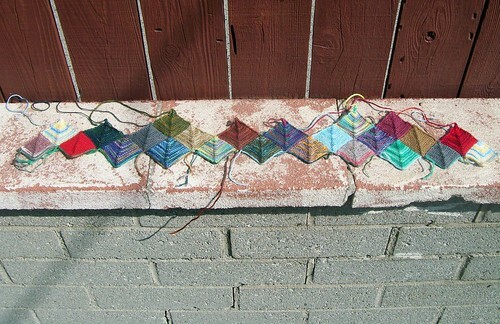 Maybe I should go knit another toy.